Lefkada Eglouvi: Eglouvi is arguably one of the most beautiful mountainous villages of Lefkada located 19 km from the centre of the island. 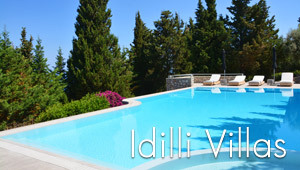 The village is built at 730 metres altitude within a vast green area and its fabulous location offers breathtaking views to the Ionian Sea. Today, it counts on 180 inhabitants most of whom are involved in agriculture. This small fertile village is well-known for the production of lentil and for its traditional architecture. It consists of beautiful stone houses and red-tiled roofs, narrow streets and picturesque neighbourhoods. At the central square, under the huge plane tree is a nice old fashioned cafe that gathers a mix of locals and tourists during the summer season. It is worth visiting this village for the relaxing and peaceful atmosphere. Some delightful hiking paths amidst the lush green forests around Eglouvi lead to small chapels, ruined windmills and old wells. A visit to the chapel of Prophet Elias on top of a hill is a great experience with magnificent views to the endless blue sea. A religious festival to honor the saint is held every year on July 20th in the village of Eglouvi.